The Victorians frequently commissioned large commemorative oil paintings of significant events, and many pictures of the Great Exhibition were made. This one was originally executed for commercial purposes, so that prints reproducing it could be made and sold. Sometimes an artist could make more money from the reproduction rights than from the sale of the original painting. Henry Courtenay Selous (1803-1890) was a London painter of genre, landscape and historical and literary subjects. He was the son of the painter George Selous and was a pupil of the painter John Martin. In 1843 he won a œ200 prize at the Westminster Hall Cartoon Competition. He produced illustrations for the Art Union and illustrated many books. The International Exhibition of Arts and Manufactures, the Great Exhibition, was initiated by Prince Albert and housed in a vast glass structure, the Crystal Palace, erected in Hyde Park. The painting shows the Archbishop of Canterbury blessing the Exhibition. Commissioners, ministers and dignitaries surround the Royal Family. More than 25,000 people attended the opening day. The artist included Sir Henry Cole, later the first director of the Victoria and Albert Museum, in the group on the left. Given by Warren W. de la Rue, 1889. The International Exhibition of Arts and Manufactures, the "Great Exhibition", was initiated by Prince Albert and housed in a vast glass structure, the "Crystal Palace", erected in Hyde Park. Henry Courtenay Selous (1803-1890) was a London-based painter of genre, landscape, historical and literary subjects, who also worked as a panorama painter. He was the son of the painter George Selous and pupil of John Martin. 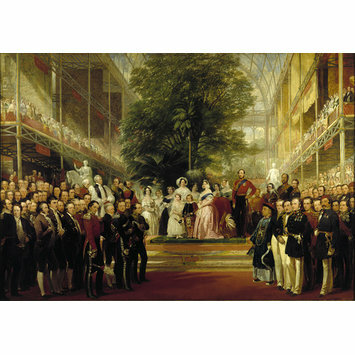 In the composition, the Royal Family is surrounded by Commissioners, Ministers and dignitaries. Individual sittings with Selous were given by many of the figures depicted; the painting functions as a large group portrait. 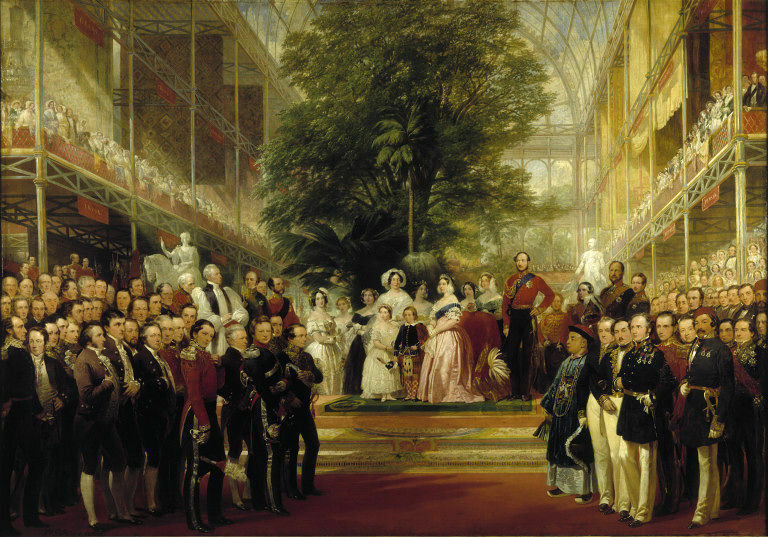 The group of four men wearing court dress in the left foreground of the picture are, from left to right, Joseph Paxton with his hat under his arm; Charles Fox, whose firm built the Crystal Palace; the bearded Owen Jones, who designed the colour scheme of the building; and Henry Cole, the first director of the South Kensington Museum (later renamed the V&A). A medal struck in 1848 in the collection of the National Maritime Museum, London, also commemorates the arrival in England of Xisheng onboard the Keying (NMM museum number MEC 1349). On the obverse of the medal is a portrait of Xisheng and the legend 'MANDARIN HESING OF THE CHINESE JUNK'. Documents in the Royal Archives at Windsor Castle record that Queen Victoria visited the Chinese ship on 16 May 1848, just a few weeks after its arrival in London. Xisheng was subsequently invited to the opening of the Great Exhibition, which he attended as a member of the group of foreign dignitaries. The painting shows him wearing Chinese official clothing even though he was not an official delegate of the Manchu government. In 2010 this painting was lent to the Shanghai Expo, and following this the Shanghai Museum commissioned a full-scale copy to be made. This was painted in the UK, partly in front of the original painting in the V&A, and shipped to Shanghai in September 2011. Oil painting of the the Great Exhibition. British, 1851-1852. Painted by Henry Courtney Selous. Expo 2010 Shanghai China. World Exposition Museum ISBN: 9787532140503.